Devcon Products are in stock and usually ship same day. Free shipping on orders over $50 and overnight shipments as late as 3 pm PST. 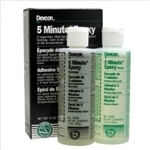 Shop Devcon 5-Minute Epoxy, application guns, cyanoacrylate, etc. Devcon metal repair liquids and putties. Devcon urethane repair epoxies and primers. 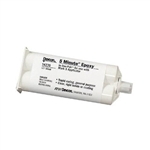 MSDS (Click Here), TDS (Click Here) Rapid-curing, general-purpose adhesive/encapsulant which easily dispenses and mixes in seconds, dries in 15 minutes and reaches functional strength in 1 hour. MSDS (Click Here), TDS (Click Here) 50 ml cartridges require applicator gun number 14280 and nozzle number 14285. Rapid-curing, general-purpose adhesive/encapsulant which easily dispenses and mixes in seconds, dries in 15 minutes and reaches functional strength in 1 hour. Tough fast curing structural adhesive with superior impact and peel resistance to most plastic surfaces such as ABS PVC, SMC, composites polyesters, polycarbonate, strenics, PET, fiberglass wood, concrete, ceramic and metal. Gel paste, ideal for vertical applications. Color coded for visual confirmation of full mix. Rapid-curing, general-purpose adhesive/encapsulant which easily dispenses and mixes in seconds, dries in 15 minutes and reaches functional strength in 1 hour. MSDS (Click Here), TDS (Click Here) Non rusting repair of metal surfaces with over 10,000 psi repair strength. Can be painted and machined when fully cured. Will not rust, can be buffed to a polished finish. Ideal for mold making and brushable. Non rusting repair of metal surfaces with over 10,000 psi repair strength. Can be painted and machined when fully cured. Will not rust, can be buffed to a polished finish. Ideal for mold making and brushable. MSDS (Click Here), TDS (Click Here) Non rusting repair of metal surfaces with over 10,000 psi repair strength. Can be painted and machined when fully cured. Will not rust, can be buffed to a polished finish. 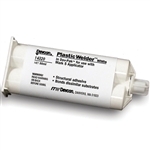 MSDS (Click Here), TDS (Click Here) Repair metal surfaces with Plastic Steel. Over 10,000 psi repair strength. Can be painted and machined when fully cured. Cures in five minutes at room temperature. 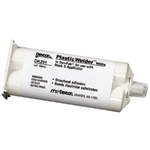 MSDS (Click Here), TDS (Click Here) Repair metal surfaces with Plastic Steel. Over 10,000 psi repair strength. Can be painted and machined when fully cured. Repair metal surfaces with Plastic Steel. Over 10,000 psi repair strength. Can be painted and machined when fully cured. MSDS (Click Here), TDS (Click Here) Tough fast curing structural adhesive with superior impact and peel resistance to most plastic surfaces such as ABS PVC, SMC, composites polyesters, polycarbonate, strenics, PET, fiberglass wood, concrete, ceramic and metal. Make long lasting repairs, molds, duplicate rubber parts, line chutes. Devcon Flexane urethane compounds are versatile and can make hundreds of repairs. Click on the Technical Data Sheet link for complete instructions and uses. We stock all Devcon Flexanes for immediate shipping. MSDS (Click Here), TDS (Click Here) Make long lasting repairs, molds, duplicate rubber parts, line chutes. Devcon Flexane urethane compounds are versatile and can make hundreds of repairs. Click on the Technical Data Sheet link for complete instructions and uses. We stock all Devcon Flexanes for immediate shipping. Make long lasting repairs, molds, duplicate rubber parts, line chutes. Devcon Flexane urethane compounds are versatile and can make hundreds of repairs. Click on the Technical Data Sheet link for complete instructions and uses. We stock all Devcon Flexanes for immediate shipping. Make long lasting repairs, molds, duplicate rubber parts, line chutes. Devcon Flexane urethane compounds are versatile and can make hundreds of repairs. Click on the Technical Data Sheet link for complete instructions and uses. We stock all Devcon Flexanes for immediate shipping. Contains two Flexane 80 putties, one cleaner and two cans of primers. Also includes applicator tools, scuffing pads and paper towels. Repairs up to 188 square inches at 1.4" thick.